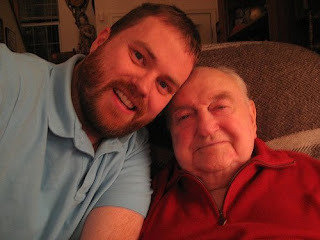 My mother just called to let me know that my father, Robert H. McKenzie, has died. He was a few hours short of his 89 1/2 birthday. He passed away in Cincinnati, Ohio, where he has lived for the past 16 years with his wife, my mother, Ginger. He was a Texas at heart, and never really left his native country. Dad was an artist and interior designer, the founder of a now-defunct artist colony, and a business man. He grew up on a farm in the Texas Panhandle, the son of two doctors who had become wheat farmers. I was his only son, he had three daughters and now has six granddaughters and a great-grandson. I am in shock right now, though I have been crying some. I don't know when I will go back up to Ohio, but the funeral will be at St. Timothy's Episcopal Church (insert denominational irony here) on Tuesday or Wednesday. I will deliver the sermon. I will try to record it so I can post it to the Hajjpod. He was a believer in Jesus. I had the honor of leading him in a prayer of faith in the Lord a number of years ago. This is comforting to me and my family right now. I want to thank all of you who have been calling, writing e-mails, posting on my blog, and posting on my Facebook page. It is unlikely I will be getting back to you any time soon, and I will likely miss some of you when I do. But please know that I am grateful for your prayers. Please pray for me, my wife and girls, my mother and sisters. Thanks to you all.